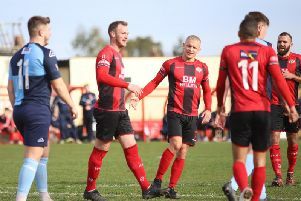 Kettering Town returned to winning ways as they beat Royston Town at Latimer Park on what ended up being an interesting day in the Evo-Stik League South Premier Division Central title race. A response was needed, a response was delivered. There was understandable concern from the Kettering Town fans after they watched their team cough up three points to 10-man Biggleswade Town last Tuesday night. It made this game with Royston Town even more important than it already was and the Poppies delivered what was needed. For the most part, they controlled the game, they created chances and they got exactly what they deserved in the form of three crucial points. It wasn’t a vintage display, it never will be on the difficult surface at Latimer Park. But the Kettering players rolled their sleeves up and showed just why they are part of this title race. It was a near-perfect response after the midweek setback. Form is temporary, class is permanent. Exhibit A: Aaron O’Connor. I’d be surprised if Aaron O’Connor has had a more frustrating season than the one he has endured so far. A serious knee injury suffered in pre-season kept him out of the early weeks of the campaign and a couple of niggles have affected him since then as well. But, as the title of this section says, class is permanent. He showed it with the late equaliser at Coalville Town and he did it again this time when his team needed it the most. He missed a huge chance in the first half but teams should give him more opportunities at their peril. Not for the first time, he was played in by Lindon Meikle and a fine low finish proved to be enough to secure a crucial win. Dan Holman, and rightly so, has taken all of the plaudits since arriving at Kettering. But O’Connor’ importance to this team should never be underestimated. Hopefully the injuries stay away for the remainder of the campaign. If they do, there will be plenty more goals to come. A defensive display to be proud of and Lathaniel Rowe-Turner deserves a big mention for it. It was widely accepted that Kettering’s defensive performance against Biggleswade wasn’t good enough and they rectified that swiftly at the weekend. Craig Stanley was a rock at the heart of the defence but it wasn’t a straightforward story after Declan Towers was forced off with a knee injury after just 21 minutes. That meant a reshuffle with Lathaniel Rowe-Turner switching from left-back into the middle while the ever-reliable Gary Stohrer came into the fray at full-back. Rowe-Turner was a key part of the defence during the Poppies’ impressive start to the season but had fallen out of favour in recent weeks. Boss Marcus Law revealed after this game that there had been a ‘straight-talking conversation’ between player and manager but whatever was said clearly had the right effect on this occasion. Rowe-Turner looked back to his best alongside Stanley and he also has that touch of class, he doesn’t mind trying to play out from the back. If Towers’ injury keeps him out, Rowe-Turner could well have a massive role to play in the crucial matches this week. Hitchin 2 Stourbridge 1. Just when you don’t expect it, a helping hand can appear. The Poppies have a huge opportunity in front of them on Tuesday night, they must make it count. Kettering have had to do the chasing for a while now but, all of a sudden, they have the chance to take over at the top. To do that, they will need to do what they couldn’t just over a week ago and that is beat Coalville Town when they take the field for a third home game in a row tomorrow evening. It won’t be easy. Coalville are chasing a play-off place and will be keen to bounce back from their 4-2 defeat at Banbury United on Saturday. It’s all ifs and buts. But if the Poppies can find a victory tomorrow then they will head to Stourbridge for next weekend’s showdown sitting two points clear with a game in hand. And that will mean the big pressure will only be on one team when Saturday comes. Interesting and exciting times.